We all knew this moment would arrive eventually. We’ve been holding out hoping that we could just struggle on with the current batch cooking pan and we made it two months, nearly three, but you tell me, would you like to keep eating out of this? Yes that is supposed to be a non stick cooking surface, but as you can see parts of it have flaked off leaving the surface underneath exposed, and unfortunately that surface underneath is rusting. We had two cooking pans which I could use for batch cooking, the first one rusted to a point we were uncomfortable with some months back, and we were down to just the one pan. We tried using baking paper hoping that would solve some of the issues, at the very least keep the rusted area away from the food, but that did not work out for us. Paper + Gravy = soggy mess. I was able to rescue that particular cottage pie with a lot of skill and talent, but clearly this was not an option for future batch cooks. The hunt was already on for a pan we could use which was dishwasher safe – the reality is, we are not going to manually wash a pan. We are dishwasher users and we know it. So some of the options were out before we even began. 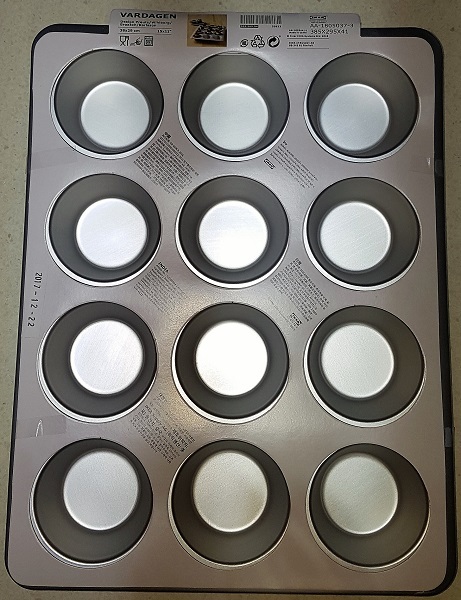 I was looking online at some options via commercial cookware shops in Sydney, and due to The Other Half having two weeks of holiday we planned a trip up to buy a new baking pan. Then fate stepped in. We listed our tandem kayak for sale on a couple of local secondhand sites in November 2017, after buying a second single kayak. I’d had a few enquiries, mostly from people who wanted to pay $500 for a kayak that currently retails for $5,000. Second hand prices on our particular kayak were mostly $2,500 or so, and we wanted to get at least $2,000 for it. There was no particular rush and we were happy to sit and wait for the right person to enquire. On the last day of February, they did, but they were in Canberra. They wondered if we could bring it over to them, and we decided that we could kill two birds with one stone – sell the kayak and buy some new cookware. 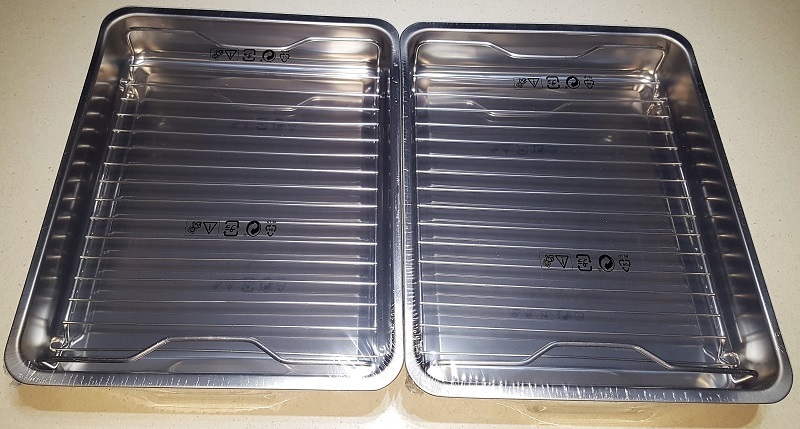 So I began looking at commercial cooking places in Canberra, and I found this one with some aluminium pans that might work. On further googling it turns out these are not dishwasher safe, and The Other Half said to me, can’t we get something stainless steel, like our two fantastic Sunbeam Banquet frypans which get dishwashed regularly without any issues whatsoever? Honestly, if I still had the box this came in, we could box our Ellise up and sell it as brand new and nobody would ever know. They are costly up front but you get your moneys worth long term. I’ve cooked in that frypan 2-3 times a week for over 18 years now. It performed so brilliantly and dishwashed so well, we bought a second one, though I managed to break the lid on that one sadly. Glass & Snoskred = a very bad idea. 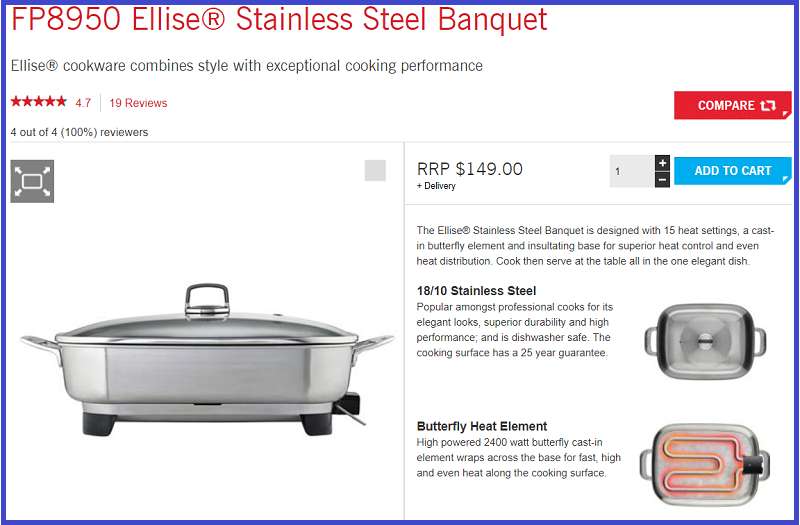 Apparently no, commercial cooking places in Canberra did not seem to have anything stainless steel. I ended up looking at IKEA and I found the KONCIS which claims to be dishwasher safe and half the price of any commercial options. We thought we would give this a try, so we planned to stop at IKEA for lunch after dropping off the kayak. 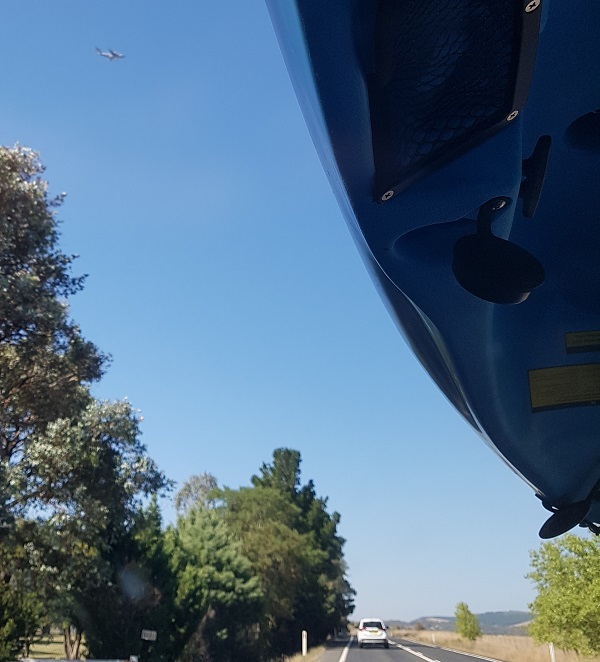 On the other hand, you do get a closer view of those wind turbines that Joe Hockey was so upset about, out near Tarago. Not much closer, but closer than you see them on the Federal Highway. Also out near Tarago, we saw this large air force plane doing loops. I’m pretty sure it was a C-17 Globemaster. We dropped off the kayak, spending nearly two hours with the new owners chatting and taking them through how it works. Then we headed to IKEA for a Swedish Meatball lunch – The Other Half had a chicken parmagiana which was one of the best he has ever had, he rated it a 9 out of 10. 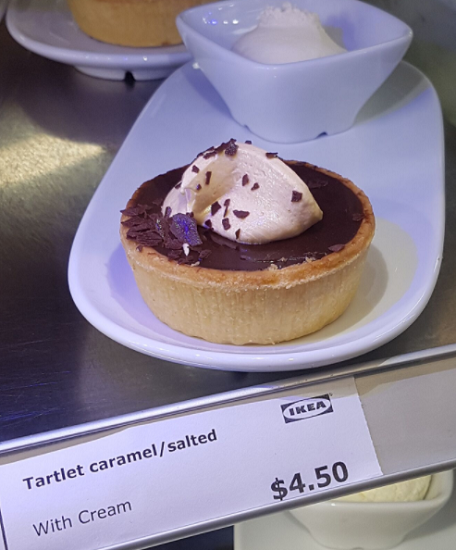 They did have this Salted Caramel Tart which tempted me but we had other dessert plans. I have never once been to an IKEA without buying candles, but this was my challenge to myself today – only buy things we need, not things we want. I have enough candles to last the year if I ration them effectively. But to make sure we were good and tempted, we walked through the entire store. I took some photos of items I did not buy – a post for another day. What did we buy? 1x Vardagen $9.99 as we had an incident with our current muffin tray and we wanted to try out the anodised aluminium. 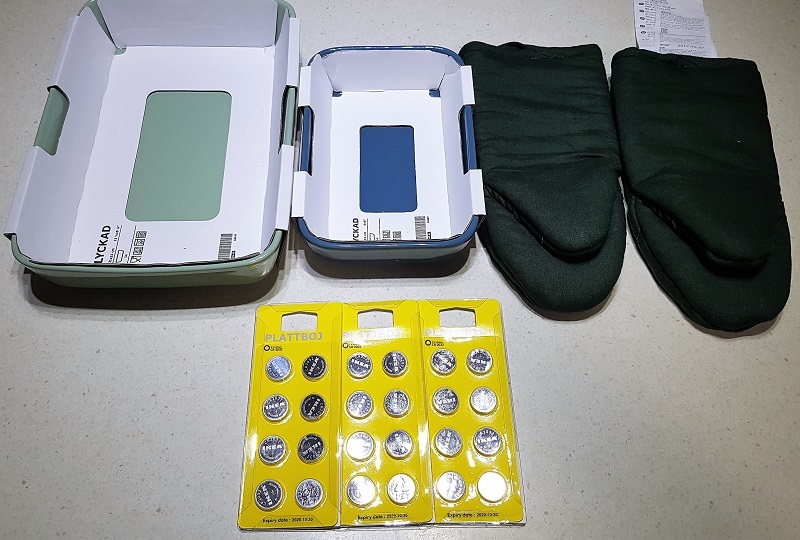 This Lyckad $9.99 and this Lyckad $6.99 to replace long-ago broken baking dishes, 2x Vildkaprifol @ $4.99ea as these are much better fitting oven gloves than the Iris we own now and those Iris are a bit stained, 3 sets of Plattboj $3.99. 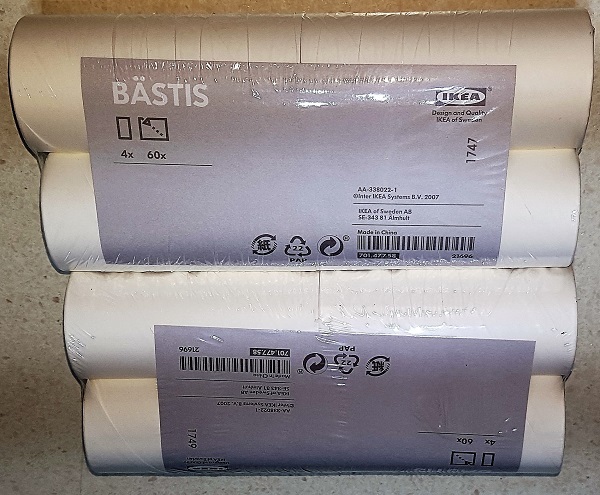 2x Bastis refills. I use these to remove cat hair from various surfaces, then I discovered that you could go straight to the source and lint roller the cats themselves. They absolutely love it! We got out of there for less than $90 and not one candle purchased. We were going to go to Frugii Dessert Laboratory as we thought it was near to an IGA store and we have been on an IGA tour looking for their carpet cleaner. However it turns out that was a SupaBarn, not an Supa IGA. So our dessert was cancelled. We dropped into Heatherbrae on the way home instead. 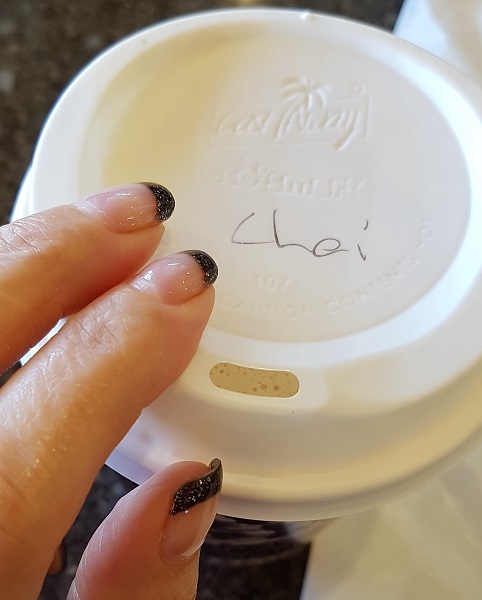 The obligatory chai latte fingernails shot. 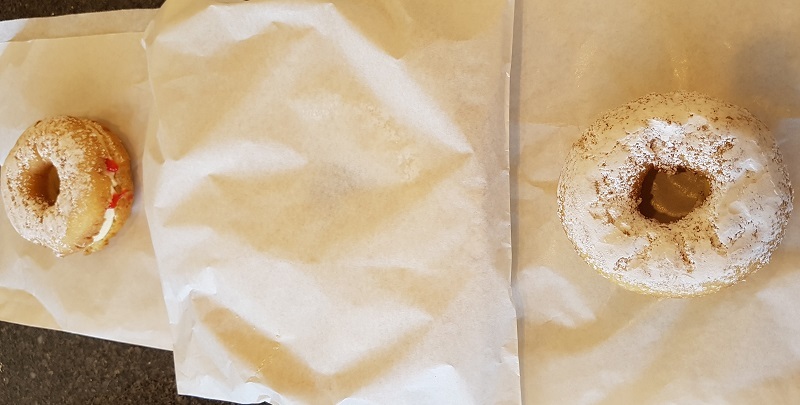 Dessert was a small crispy donut with cream. I also picked up a cherry and apple pie for desserts this week as The Other Half has gone camping – which makes three dinners and desserts where I can have what I love without having to worry that he does not love it too. I made a massive Chicken Cacciatore filled with things The Other Half does not eat AKA olives, mushrooms, and anchovies on Monday and there are leftovers for the next two nights and maybe even nights after that. It is so nice to not have to cook for a few days. So, I will have to make a new graphic for the end of month #yobn post this month. Nay, something bought in March. Rule No 1 of this challenge went as follows – If we both agree that we NEED something, we will buy it. Everything else here was also a need, not a want. I was down to one ceramic baking dish after some of our old ones cracked and broke last year, the oven mitts were too big for our hands and food stained, and I won’t post the photo of the muffin tin because it looks so bad, after some of the coloured Coles patty pan liners left their colour behind – yes I did not even know that was a thing that could happen, but it has not washed off even after several dishwashings. Only plain white ones from now on, but the coloured ones were handy to tell my baked goods apart from his baked goods. I always enjoy reading about your shopping road trips. Good to know the Ikea cookware is good. People rave about their kitchen fit outs as well…. might need one of those one day too. I hope they pans work out well. One day they will perfect non stick cooking surfaces, but they haven’t yet. I still haven’t tried Ikea meatballs….one day. I think your route was the way I wanted to go on our road trip, but we were not allowed because of unsealed roads. I was pleased with the route we took past Fitzroy Falls anyway. Cookware is not only a necessity but a safety issue as well – flaking non-stick surface is not going to be good for you! 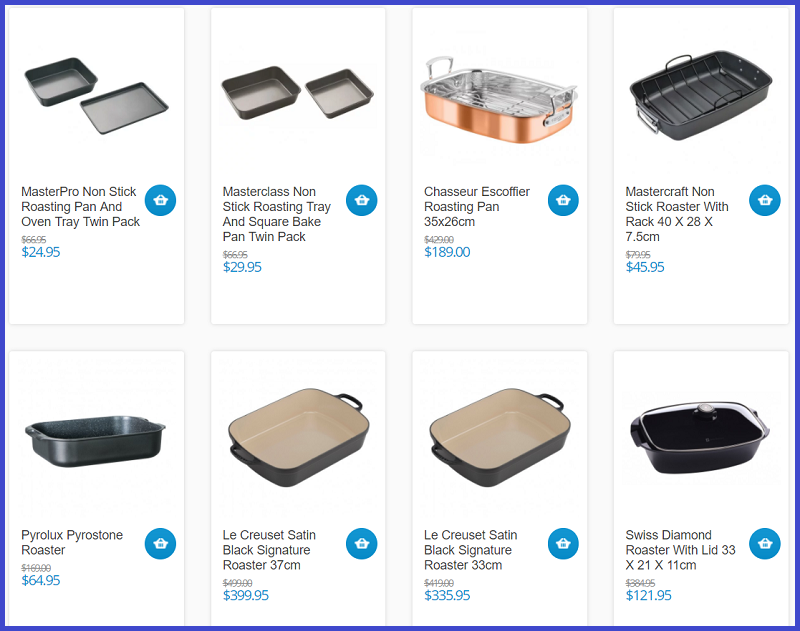 And since you’re saving money and time by batch cooking, I would chalk this expense down to “productivity tools” :) I will definitely check out the oven trays next time I visit IKEA, the ones we have are not impressive and if something can’t go in the dishwasher, it’s dead to me. I love that last sentence, it is dead to me too! We have already dishwashed the new stuff and it went very well, but of course we have not cooked anything in it yet. :) IKEA are great for dishwasher safe items, I especially love their kids plates, bowls and cups because they are plastic and I cannot murder them with dropping. It definitely is something I consider a need and the batch cooking does save us huge amounts of time and money. What surprises me is all the non-stick cookware claims to be dishwasher safe and it has a lifetime guarantee. 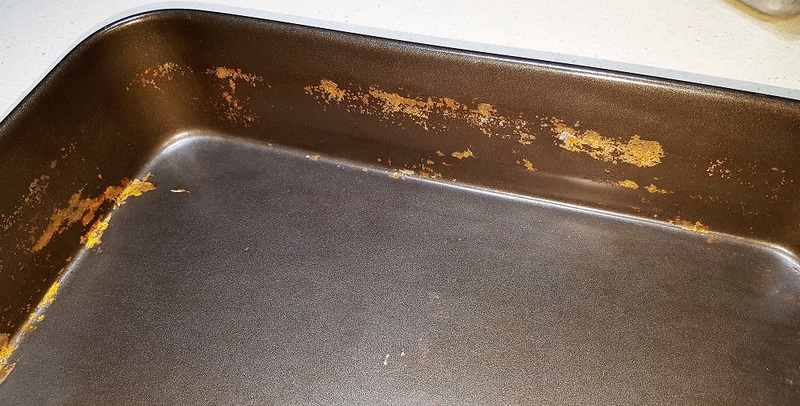 We have already gone through the process of making a claim on that guarantee with a previous set of pans, which of course eventually flaked and rusted again. So we have not bothered this time and I guess that is what everyone does, and that is how they make money. :/ Seems a bit like a scam to me. Not a fan of non stick surfaces either, Prefer stainless steel or Pyrex and was lucky enough to be given some Corning ware.. if it breaks … it breaks. It was good to get your opinion on the Sunbeam fry pan because that is something I really do need as mine – which is Stainless steel – has parted from its base and now the bottom tin plate is unstable.. so waiting for the end of year sales for a new one and will take your advice here. Your right about that road… it can be tricky, but a lovely drive all the same. All this and the only thing I remember is the salted caramel tart! I had to buy a new rice cooker because the teflon coating was coming off. I’ve switched to more stainless steel lately. I have an imitation Le Creuset baking pan but I haven’t tried it in the dishwasher! I have had the veggie “meatballs” at Ikea twice now and liked them (really veggie balls and not at all pretending to be meat).